You might think the words “wine” and “snob” are redundant. Like “cold” and “snow” or “sweet” and “candy”. And you’d be right — except if you came to CRÚ. You’ll find no little pinkies extended, no noses in the air. We prefer you gently bring them to the edge of the glass and allow the aroma to prepare you for a new, fun experience in the enjoyment of wine. That’s why we created CRÚ — the first wine bars in Texas to offer 30 wines by the glass, 300 splendid bottles from all over the world and at every price point. But we didn’t stop there. We pair the wine with Napa style foods. Oh, and for those of you from Colorado, we’ve got CRÚs there, too. 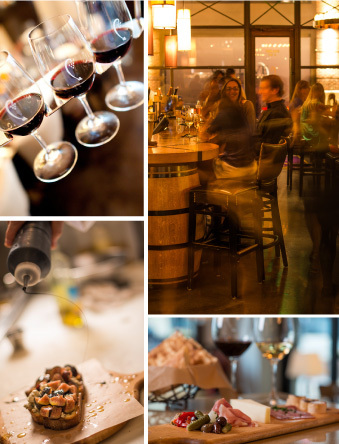 CRÚ is about you, and your inalienable right to the unbridled enjoyment of wine and food. We demystify the world of wine, we keep it cool, and make hundreds of wines accessible to you in an elegant, casually hip environment. So forget stodge. Forget pretense. Come to CRÚ and we’ll direct you through our stunning assortment of wines to help you pick just the right one for the occasion and your pocketbook.